“Bermuda remains on the precipice when it comes to protecting its natural resources, particularly its coral reef system, which provides us with provision, protection and pleasure. Therefore, it is vital that we, as a society, continue to seek ways to conserve this indispensable resource,” the BZS said. “Thanks to the continued support of lead sponsor HISCOX, the Bermuda Zoological Society [BZS] is heading back out on the water with its team of citizen scientists to survey coral reefs around the island for a third consecutive year as a part of the annual BZS Reef Watch. “The event, which is also supported by Groundswell, supports the ongoing research of Bermuda Reef Ecosystem Analysis and Monitoring [BREAM], under the direction of Dr. Thaddeus Murdoch. 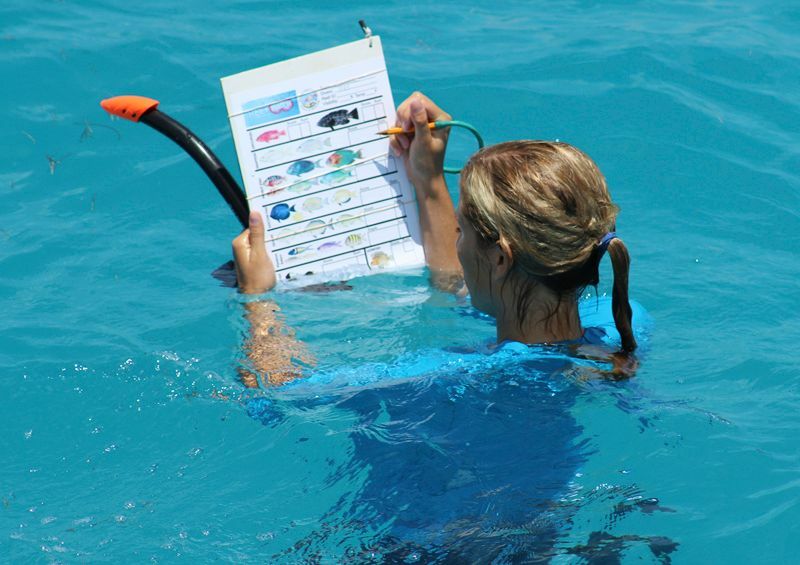 A Reef Watch participant records data on the numbers of fish seen on their assigned reef. Speaking on our coral reefs, Jeremy Pinchin, CEO of HISCOX, said: “Our protection of them remains vital today given the protection they provide to the island and the economic benefits the island derives from them. “They will provide a glorious backdrop when the island is on show to the world during the America’s Cup. We hope everyone privileged to live in Bermuda can join us, in any way they can, to help protect this wonderful asset. 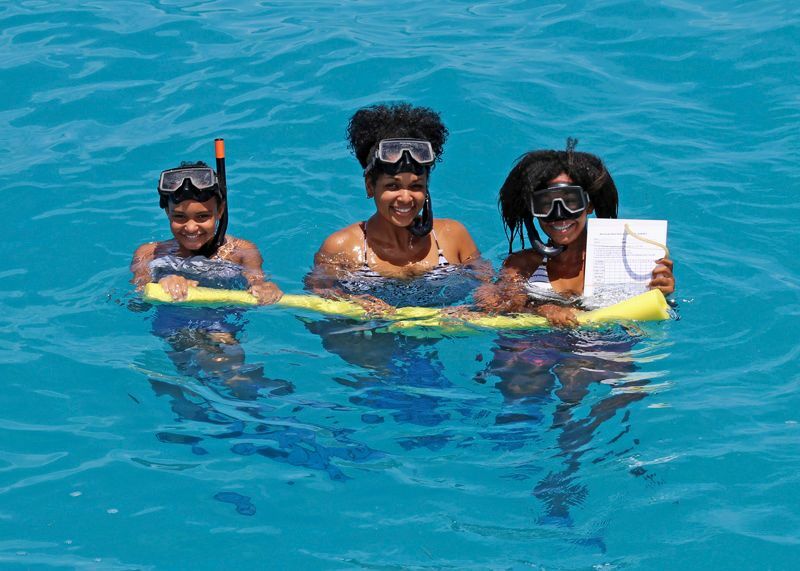 The BZS added, “Coupling sun and sea, fun and excitement, with civic responsibility and a little bit of good-hearted competition, Reef Watch participants have a unique opportunity to enjoy a pleasurable day out on the water whilst making a lasting contribution to ongoing research into Bermuda’s coral reefs. “While Bermuda currently has some of the healthiest reefs in the world, ongoing monitoring allows scientists to more easily monitor and protect hundreds of square miles of reef to ensure that Bermuda’s reefs continue to be conserved for future generations. “The day was incredible and we had a great time surveying our healthy ‘Coral Coast’, not to mention the phenomenal results and barbecue. The event is really well organized,” shared Sam Outerbridge of Coral Coast Clothing, whose team ‘Coral Coast’ were the top fundraising team during the 2014 event. Desiring to demonstrate good corporate responsibility, the clothing company saw BZS Reef Watch as a natural fit. 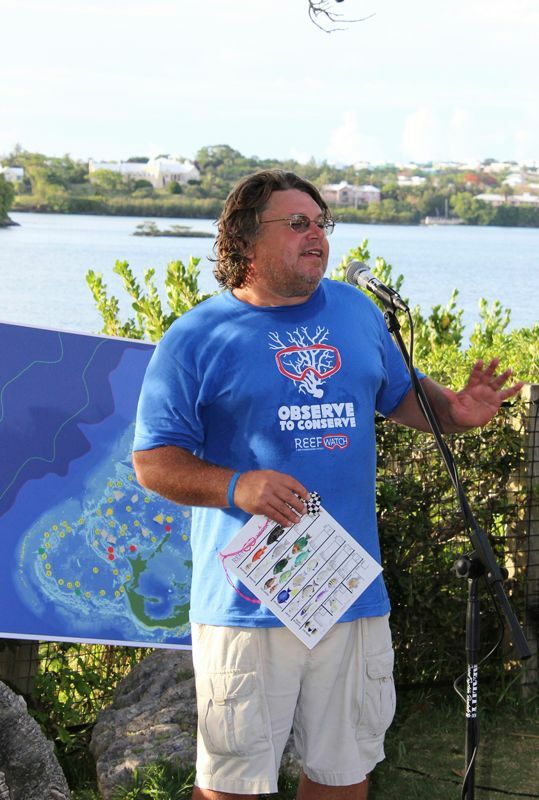 Dr. Thaddeus Murdoch, lead scientist with BREAM, shares an overview of the data collected in the 2014 Reef Watch event. The BZS added, “This year, the event is scheduled for Saturday, June 27th and it is hoped that many more will join in. Each team of four will be assigned two reefs and will be provided with the necessary training to successfully conduct a survey on the health of those reefs. “Teams must provide their own water transport out to the reefs, and are also asked to try and raise at least $500, the proceeds of which all go towards reef conservation and protection. “Without question, those participating in BZS Reef Watch are sure to have an excellent time. Those interested in creating or joining a team are encourage to visit www.crowdrise.com/reefwatch, or for more information, contact development.bzs@gov.bm. Training nights are scheduled for June 23rd and June 24th. A training video is also available online as a refresher for past participants [link here].